I'm overwhelm by music projects, that is why I did not write on this website since a long time. I have been busy mainly by Ben Sasseville Project's. We are recording presently to produce a nice record which will be release sometime in the spring of 2011. We are at the end of the recording process. We are currently recording the voices and doing the mix down. On a classical note, I sang with the Coro San Marco, a choir from Toronto at the Mondial Choral in Laval last June. I also performed with the Montreal Welsh Choir in a couple of concerts. On a jazzy note, I am accompanying the signer Myriam Sévigny with a jazz quartet. We are performing jazz and blues cover. We will post here our coming shows.We were suppose to perform earlier this spring, but unfortunately, we had to postpone because of the wheather. To finish on a singer songwritting note. I just started to write new songs in English. I'm not ready yet for recording them, but I should have very soon enough material for a recording. You can buy Jerome first DVD. We've capture on DVD Jerome's first opera recital. It was recorded in November 2007 at la butte St-Jacques.You can also buy Jerome's performance with l'orchestre d'harmonie Leonardo Da Vinci recorded on June 28th, 2008 at the Cultural Centre Leonardo Da Vinci Click here to obtain more informations. Christmas concert with the Orchestra Leonardo Da Vinci in St-Leonard Center, 8350 Lacordaire boul. in St-Leonard. Opera recital with Annie Sanschagrin at la Butte St-Jacques, 50 St-Jacques Street O.
I played with Ben Sasseville and his Mandibules, at la Casa Obscura, 4381 Papineau, Mtl at 8 O'clock.I finally met Luc Sasseville, Ben brother who played to warm up the crowd. Yesterday night, we've performed to raise funds for the theatre troup Caméra Obscura at Space La Risée. Caméra Obscura will be doing a play call l'Araignée that will be presented in September. It was a real night on the Corde à linge, the theme of the evening. The waiters and a lot of artists were dressed in underwear on top of their dress. It was kind of weird ! At La Ripaille tonight, we've done, the Mandibules and Ben Sasseville, a show in front of a cheering crowd. It was a nice experience to play with les Voix de la relève.. The first opera recital of Jerome as a tenor. Accompained by Denis-Alain Dion on the piano at la butte St-Jacques, a fantastic room to present intimate concert. More than 50 spectators attented to the event. The recital is immortalized on a DVD. TO obtain your own copy, Click here. Hello Everyone! We did two great show this week. One was at l'Absynthe last Sunday night and the other one was tonight at la Butte St-Jacques. It was our best show so far. We had a lot of fun! What a Great Election Gala for the NeoRhino party! I did perform with Ben Sasseville a short 5 minutes at the Kola Note with renowned quebecois artists such as Guy-Philippe Wells, Ève Cournoyer, the Abdigradationnistes and also Claude Lamothe. It was a real pleasure to share the stage with those guys. The Mandibules and Ben Sasseville has performed a few nice shows. We performed on September 1st at Art café, the 24th of August at the Dépanneur café in a hot and humid atmosphere and last Saturday, the 16th they were permorming at the Bistro Double Dose. It was their two first shows as a band. Srikanth Narayanan plays electric bass, Joseph-Antoine Martineau-Gagné plays electric guitar, Jérôme Savoie plays keboards, mandoline, guitars, harmonica and voice, and not the least, Ben Sasseville sings, plays guitar and ukulele. The 16th of August, we were accompanied by Alex K. on drums. Monday May 21st, I will be performing my compositions with Paul Fraisse at the piano-bar le Spectateur (54 Saint-Jacques West). Paul is a specialist of the art of slaming, a discipline where the slammer improvise a text with rhymes. The idea of doing a show with Paul is born from our collaboration at La Musika dell'act and from the slam session's night hosted by Nousici. We will be performing Jerome's old compositions with some experimentations, some slam and a few compositions in progress. Our ultimate goal is to do a show before Paul's return in France. Ticket price and hours of the show has to be confirm. Stay tune! Come and see one of the Musika dell'acte shows: May 22nd, May 29th.We will be at Café Chaos, 2031 St-Denis street between Sherbrooke and Ontario. Starting at 20:00, 5$ at the door. The Musika dell'acte, is an experimental theatre where I assume the role of conductor as well as musician. To all my friends, I feel sorry that I haven't took the time to write you a little note earlier here on my website. Life is so busy and so many things to do when you are an independant artist.To write a website, both in english and french at the same time is not always easy but I will keep on. See Ya! 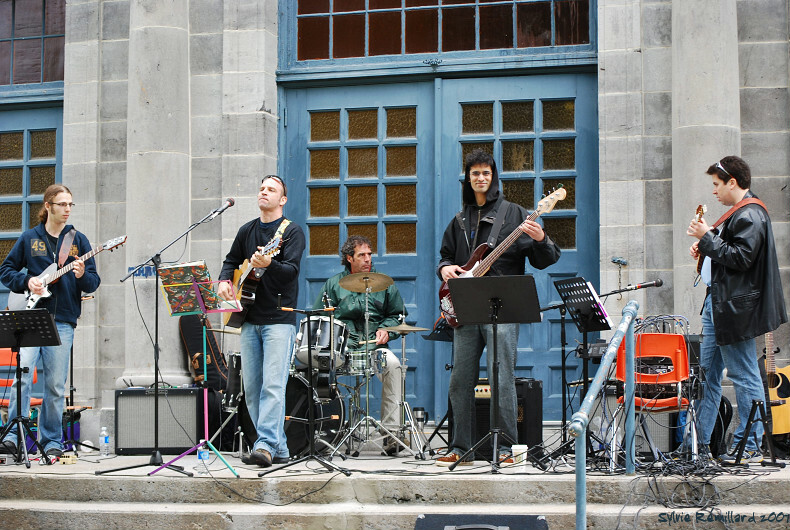 November 2nd: "Chansonnier" for the Canadian Forces Language School at Saint-Jean Detachment. March 2nd: Jérôme at La Butte St-Jacques in the old Montreal.50 Street St-Jacque West. Jérôme will be performing his compositions.You can reserve your tickets in advance. More informations has to come. If you missed Jérôme with the Myriam blues band in Val David, you will have the chance to see us again. New dates need to be confirm. Check out again the site, because we will make a section only for that project. You can also hear Jérôme every Sundays for the 10 O'clock mass at St. George Antiochian Orthodox Church, 555-575 Jean Talon Est. On May 28th, Jérôme celebrated Michel Pharand year as a "chansonnier" at Les Grillades du Parc in Repentigny. Jérôme has performed a few songs with Michel . You can hear Michel Pharand every Sunday at Les Grillades du Parc in Repentigny, 285 Notre-Dame street. Informations: 450-582-3336. The afternoon concert on May 28th at Mountainside was a nice success. There were near 300 people at the concert and the soloist sang very well. A few words to let you know that I'm still alive and that I am working very hard on my projects. Right now, I work with a director, Myriam Sévigny, on my compositions as well as my performing skills. This summer, you will be able to hear me in a few clubs around Montreal singing with my guitar. As soon as I receive the confirmations, I will post them on the site. I am still working on my recording, though I won't release it in June neither predict when it will be release. You would already listen to it if I had sign with a major label, but being independent means that you do everything yourself and it's a bit longer. On April 20th, Jerome sang once more as a chansonnier for the Canadian Forces Language School at Saint-Jean Detachment. Over 20 different countries were present to the celebration. Martin Maheux concerts at the Petit Medley and at theatre Plazza were a huge success. You can listen to his music on www.postedecoute.ca His record, MMCIRCLE, is call Sibyle. Enjoy it! I wish you a wonderful summer and I will write soon on this site for the concert dates. See ya! We finally received Jérôme’s latest video: Entre elle et moi. It's really good. I hope that you like it as much as we do. For those who have contributed to the shooting, we will send you a DVD in the next couple of weeks. The video should be posted on this web site shortly. We would like to answer a few questions that you've asked about Jérôme’s shows and his next recording as well. Recording: Last fall Jérôme wanted to release his first recording 6 or 7 songs. After a great deal of discussion, we decided to work on a full album instead, - about 12 songs. So the release didn’t happen in the fall, but it should come out sometime in June. Jérôme is presently writing new songs that he wants to enter in Quebecois competitions such as Granby and Petite Vallée in late February. The new songs will probably be recorded in March and April. So if everything goes as plan, you should hear Jérôme’s music on your Ipod in June. We will send you the information by e-mail. So you won't have to check this site every couple of days. Jérôme’s next appearance will be February 12th at Mountainside Church, 4000 The Boulevard, Westmount. He will sing with the choir during 11 o'clock mass. He played tam tam while canoeing along the North River for the René Derouin Foundation. November 3rd: Jérôme sang for the Canadian Forces Language School at Saint-Jean Detachment in front of military from 24 different countries. Jérôme sang at Bordeaux prison for a Christian cafe for father Jean who was retiring that night. We filmed this weekend shots for our latest video: "ENTRE ELLE ET MOI". We would like to thanks the whole team at the Sergent Recruteur who welcomed us as kings. Thank you very much Louis, Daniel and Danny. Thanks to all the extras who allowed us to shoot some fantastic scenes. Sincerely thank you from the bottom of our hearts. All we have to do now is the edit. As soon as it is ready, we will post it on the net. For those who have contributed, we will send you a DVD. Thanks also to Ginette Bolduc for the kiss, we were so shy and in the end, it was a breeze! And last but not least, thank you very much Kevin Armstrong, director of this new video, without you, it would never have happened. 15th of January: In solo at "les Conneries"
We are still in the making of Jerome's first cd, we are starting to mix the songs. If everything goes as planned, it should be released for the fall of 2005.